The interurban terminal station and freight house recently completed at Columbus, Ohio, is a fine example of the modern station construction which the Ohio Electric Railway Company is making standard. The terminal station building is creditable to the architects who designed and built it and an evidence of the far-sightedness of the management in that it was constructed not only for the present requirements but with a view to its future enlargement for office and traffic purposes. 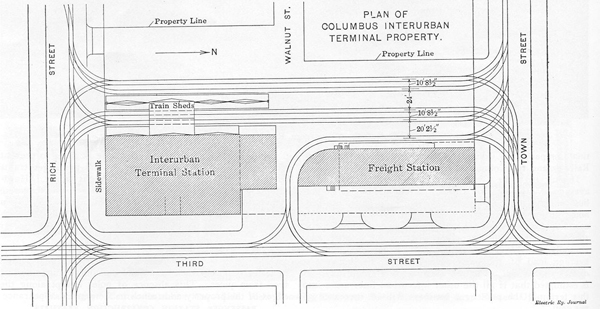 Columbus Terminal - Plan of Property, Showing Relative Location of Freight station and Tracks. 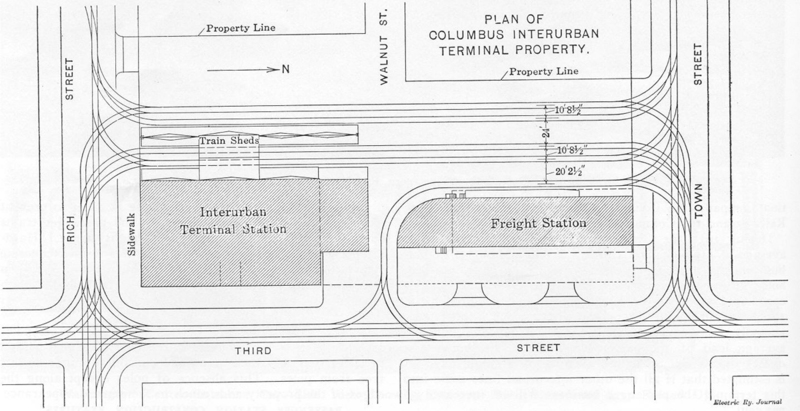 The buildings, which are of modern fireproof construction, were built by The Columbus Interurban Terminal Company, a subsidiary organization of the Ohio Electric Railway, and are so located and built that they offer ample passenger terminal facilities for all the interurban lines now entering Columbus. These lines include the three divisions of the Ohio Electric Railway running to Zanesville, Dayton and Orient, and the lines of the Scioto Valley Traction Company, the Columbus, Urbana & Western Electric Railway and the Columbus, Delaware & Marion Railway. During 1911 the Ohio Electric Railway alone ran an average of 140 passenger trains a day in and out of Columbus, and this number increased to 160 trains in twenty-four hours during the summer months. It is estimated that this company carried 500,000 people in and out of Columbus in 1911, and during the Ohio State Fair, which is held there annually, forty cars were sent out of the terminal, with an average load of 100 passengers to each car, between 4 o'clock and 8 o'clock in the evening of a single day. It is estimated that if all the other interurban lines come into this terminal the passenger business will be increased 50 per cent. The figures recorded give one an idea of the immense amount of passenger business being handled by this company in addition to the twenty-two regular and extra express and freight trains run daily. This freight traffic includes all classes and approximately 45,000 tons were handled last year. The terminal is located within two blocks of the State Capitol building and the heart of the retail district of Columbus. It is also about an equal distance from the manufacturing and wholesale district, as are the competing steam lines. The additional facilities provided in the new terminal, which is so centrally located, are expected to increase both the freight and passenger business materially. The Columbus terminal property, located on Third Street between Town and Rich Streets, is approximately 190 ft. by 405 ft. in plan. The passenger station has been erected on the corner of Third and Rich Streets, and the freight house is located at the opposite end of the property on the corner of Third and Town Streets. The general track lay-out is in the form of loops around the property so that no switchback movements of trains will be necessary. All trains approach the terminal from the north and leave at the south. A house track loop has been provided around the freight house in order to prevent express trains from interfering with the passenger trains when unloading freight into the freight house. Hard center special track work on wooden ties with a concrete foundation has been used in the pavements and "T" rail in the yard tracks. The yard tracks were ballasted with crushed rock and the entire yard leveled off to the tops of the ties. The overhead lines are carried on tubular steel poles set in concrete. Their location received careful attention in order that the track areas and concourse might be left free from poles. This absence of poles except along the edges of the property adds much to the general appearance. 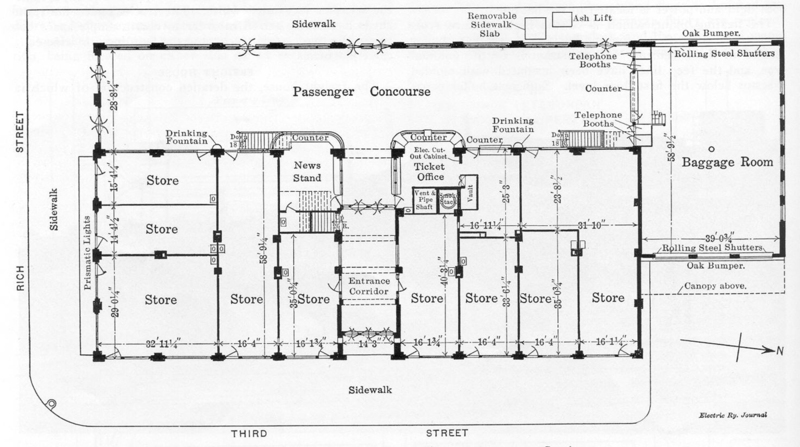 The passenger station is a two-story and basement brick and steel structure, 87-1/2 ft. x 184 ft. in plan, built on a concrete foundation. The foundations and steel frame were designed with a view to its increase in total height to eight stories. The additional stories will be added when there is a demand for offices in that section of the city or when the railway company may need more space for its own use. The outside walls are faced with a dark red tapestry or homespun-type brick, laid in mortar colored dark red. The trim, which includes all windowsills and lintels, ornamental caps to pilasters, belt courses and cornice, is of white unglazed terra cotta, and the water table is of gray Bedford stone. The striking contrast in the color scheme, as well as the architectural treatment of the entire structure, makes a building very pleasing in general appearance. The windows are a departure from the usual design in that those on the second floor are all triple windows with one fixed all-glass sash in the center and ordinary sliding sashes on either side. All sashes and frames are made of cypress and the entire building is glazed with plate glass. In the design of roof it was necessary to take the future height of the building into account. This was done by locating the roof slab at the same elevation as the third-floor level and varying the thickness of the slab to give it proper pitch for a four-ply asbestos-felt roof covering. The floors are all of reinforced concrete underlaid with hollow building tile to form the fireproof ceilings. The partition walls are also laid up with fireproof hollow tile. The floor wearing surfaces in the concourse and corridors are of terrazza and those in the retail storerooms are of hard maple. The basement, which is finished under the entire building, contains space for the heating plant, coal storage and toilet rooms. The latter are accessible from the passenger concourse by way of two steel and concrete stairways. 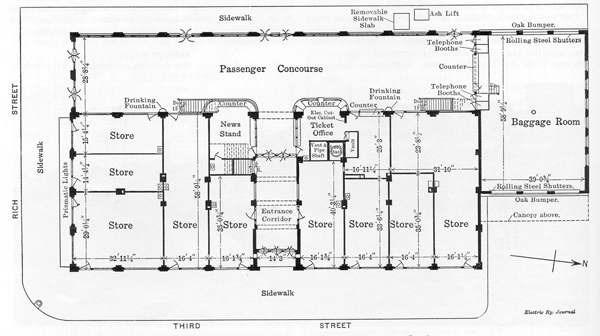 The first floor contains the passenger concourse 140 ft. x 28 ft. 6 in. in plan. A large baggage room has been provided at the north end of the concourse. Its location allows baggage to be unloaded from the transfer wagons directly into the building, which is provided with large rolling steel doors on both the trackside and the driveway side. 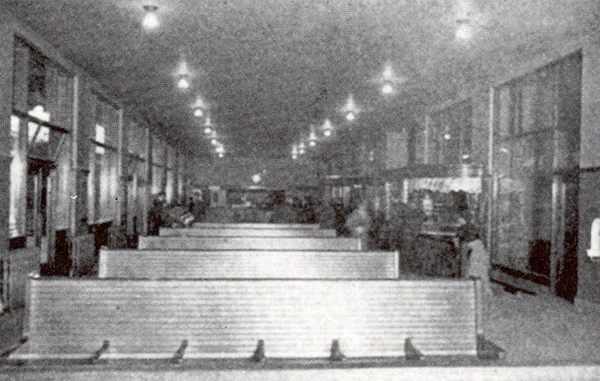 The ticket office and news stand are given a central position, being located on either side of an entrance corridor which extends through the building from the Third Street side. Rooms for retail stores, well lighted and varying in size to meet almost any requirement, occupy the larger portions of the Rich Street front and all of Third Street. The finish on the first floor, including the station seats, is quartered oak, stained slightly, then varnished and rubbed so as to leave a lusterless surface. The walls are provided with a pink Tennessee marble base and painted a chocolate brown to a height of 7 ft., with buff walls and ceiling above. The combination of colors gives a very pleasing effect in contrast with the dull black finished hardware, grilles and light fixtures. The second floor was planned for office purposes exclusively and is provided with a wide corridor, which is lighted by chipped glass sash in the office partitions. The offices are unusually light, being provided with triple windows. The woodwork on the second floor is finished the same as on the first, and the terrazza floors are replaced with mosaic tile in the corridors, and there are hard maple floors in the offices. A white marble wainscot 4 ft. high is used in the corridors on the second floor and in the stairways. The walls and ceilings have been tinted with three shades of buff, lead and oil paint, the dark shades being used on the walls and the light buff on the ceiling. All stairways are provided with ornamental iron balustrades with oak handrails. The treads and risers on the stairway between the first and second floors are marble, set up on an all-steel stair frame. The entire building is lighted with tungsten lamps provided with holophane or alba shades. The lighting circuits are of the three-wire type carried in iron conduits with the switches for the passenger concourse, ticket office, news stand, baggage room and public halls and toilets placed in the ticket office. All storerooms and office rooms have individual control switches and the main cutout cabinet for both light and power is located in the basement. The heating plant, which is of the high-pressure type, consists of a 16-ft. x 6o-in. horizontal tubular boiler located in the basement. All radiation is of the colonial type, and the feed lines have been insulated with molded asbestos below the first floor level. Sufficient boiler capacity has been provided to take care of the additional six stories as well as the trainmen's room and freight office located in the freight house. The train sheds over the platforms, which are shown in the accompanying illustrations, extend the full length of the building and are of the canopy type, except that portion over the concrete platform extending from the station to the platform between the sets of tracks. This part of the train sheds is a gabled structure reaching from the station building to the shelter over the outer platform. The supporting frame for the sheds is of structural steel, and the built-up wood roof is covered with five-ply asbestos felt. It will be noted from the illustrations that the designers have taken advantage of the shelter construction to support the overhead lines by extending three of the shelter columns through the roof. The train sheds are painted dark green on the exposed side, and that portion unexposed to the weather is painted white. The tracks under the train sheds have been paired in order to obtain ample space between the two sets of tracks and the building for wide concrete platforms. The freight house, the detailed construction of which is shown, is located on the north end of the property and is built of the same quality of brick as the passenger station, but the architecture is of a plainer type, which does not require the terra-cotta ornamentation. The building, which is 41ft. x 196 ft. in plan, is supported on concrete foundations and a wooden roof covered with a built-up roofing extends over the outside walls, so as to provide shelter for the unloading platform on the track side and the trucks on the team side of the building. The platforms are of wood supported on concrete piers. The floors in the freight house have concrete sidewalk finish. They are laid on earth fill in the freight house proper and are reinforced over the basement section. 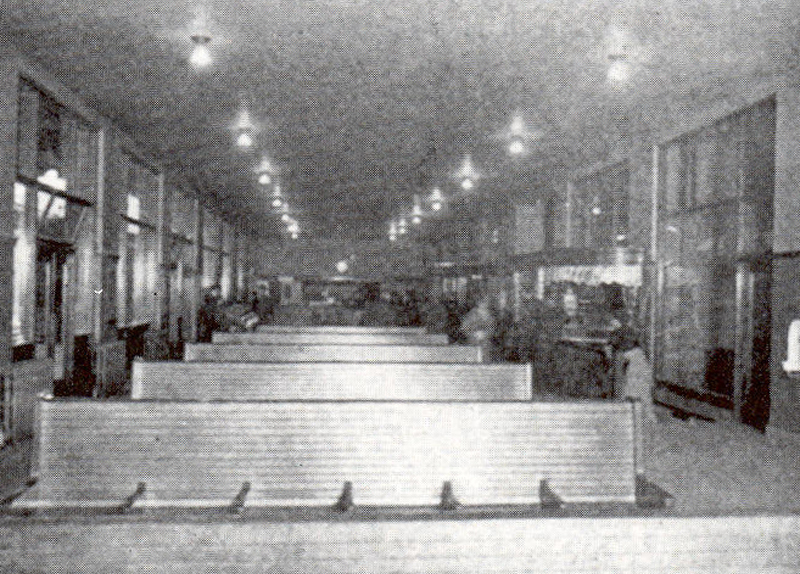 Chain-operated rolling shutter doors, 8 ft. wide and 10 ft. high, have been provided at frequent intervals on both the track and team side of the freight house, so that the whole building when all doors are open offers no more interference to freight truckers than an open platform. Two Springfield Automatic 500-lb. capacity platform scales have been supplied on the freight-house floor, which automatically balances, indicating the exact weight on a large circular dial. The team side of the building will be paved with brick from the curb line to the building, thus eliminating the usual difficulty of stalled transfer wagons in the driveways. A trainmen's locker room with telephone booths and toilet and the freight agent's office occupy one end of the freight station. A basement has been excavated under these two rooms and will be used for storage purposes at the present time. The freight station is lighted by tungsten lamps supported on drop cords at a close spacing both in the freight room and offices. Owing to the limited space on the terminal property the freight station was built for the use of the Ohio Electric Railway only, and it is anticipated it will be outgrown for general freight purposes in a few years. When this time comes, however, the management will use it for its, express and milk traffic and will provide a larger bulk freight station, yard and team track facilities at another location. D. H. Burnham & Company, of Chicago, were the architects on both building designs and Maetzel, Tresselt & Bassett, of Columbus, Ohio, were architects on construction. All worked under the general supervision of B. J. Jones, general manager, and Gaylord Thompson, chief engineer of the Ohio Electric Railway.